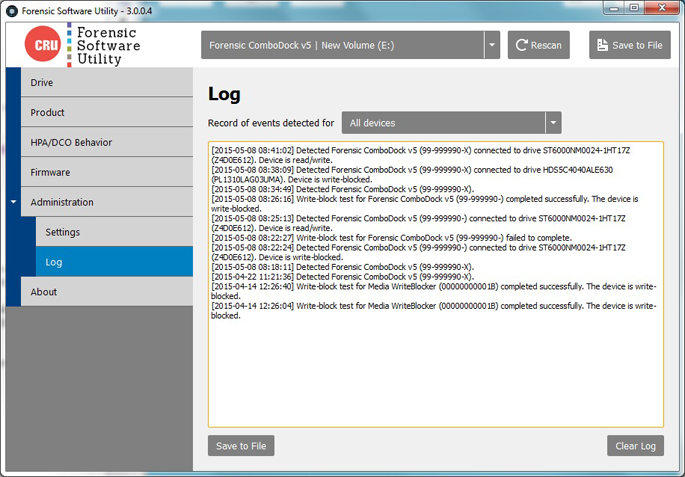 The CRU Forensic Software Utility provides an easy-to-use method to interact with and validate functionality of various CRU WiebeTech forensic products and drive docks. 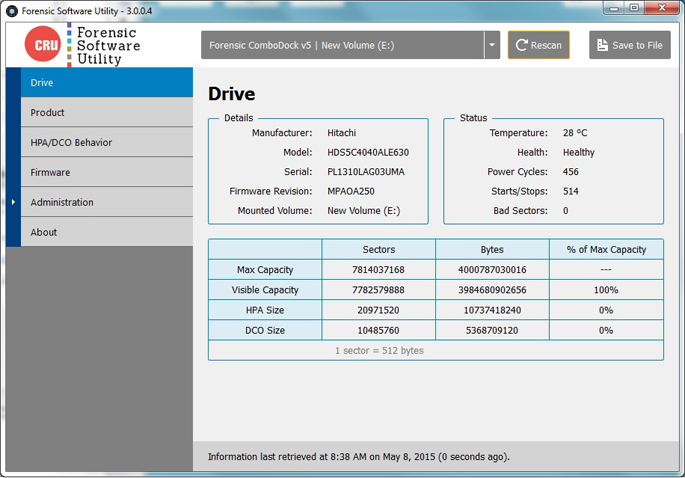 After a CRU Dock is connected, you can view information both about the Dock itself, as well as the attached drive. Model and serial number information is available, and can be saved with the “save info…” button. Files can be saved in either text or HTML format. CRU occasionally updates firmware for forensic products to add new features or enhance compatibility with the FSU application. FSU can show you the current firmware version on attached products and notify you if a newer firmware version is available. Note: a separate app, CRU Configurator 4.0 for Windows, is needed to perform the firmware update. This special feature is available for write-blockers designed for USB devices: USB WriteBlocker, Media WriteBlocker, and USB DataDiode. Although these products cannot be reprogrammed and do not support firmware updates, FSU can offer piece of mind that the products have not had their firmware tampered with. FSU calculates a hash value for the firmware on the product and reports whether the hash matches known-good values. CRU forensic products with LCDs allow you to select from these options on-the-fly. Products without LCDs can be configured via FSU to use your preferred HPA/DCO mode. By default, such products will only detect and indicate the presence of HPA/DCO areas, but not unhide them. "Overall, we were highly impressed with the Ditto FieldStation. For the price, we feel that any computer crime fighter would be happy to have a WiebeTech Ditto Forensic FieldStation in his tool belt."